The Jersey Shore Boca soccer club announced today that it has signed six additional players to the club’s Premier Development Team roster including Penn State University standout Chad Severs. The Boca PDL side will travel to Trenton on Saturday May 31st for a 5:30pm start against the South Jersey Barons. The Jersey Shore Boca soccer club announced today that it has signed six additional players to the club’s Premier Development Team roster including Penn State University standout Chad Severs. The Jersey Shore Boca PDL team (0-1-0) will travel to Mercer County College in Trenton on Saturday May 31st for a 5:30pm twilight start against in state rival the South Jersey Barons. Severs, who hails from Ocean City NJ, started all 24 games for Penn State as a sophomore. 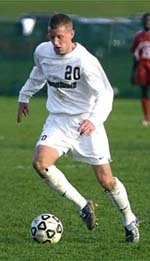 He led the Nittany Lions in scoring in 2002 with 17 goals and 3 assists. Severs garnished NSCAA Regional All-American and first team All-Big Ten Conference honors in his second year. As a freshman, Severs started in all 20 games and tallied 5 goals and 5 assists. For his efforts in 2001 he was named the Big Ten Conference Co-Freshman of the Year as well as taking second team All-Big Ten Conference honors. In addition to Severs, Jersey Shore Boca has also added Giafranco Tripicchio (Princeton University), Adam Sthay (Loyola Marymount), Andrew Cottrell (Lafayette College), Tom Poznanski (Monmouth University) and Jimmy Gaven (Seton Hall University) to their PDL roster. “I am pleased with the talent level of our team. The team is built around our older players such as Dan Annan, Kemal Kansu, Ed Decker, Adam Curtis, and Mike Hayes,” said David Vaudreuil head coach of Boca’s PDL team. “Our line up for Saturday is very strong. The questions are going to be are we fit enough and will the lack of playing time together be a factor. We are very talented and experienced in the back and if we have the legs should be very dangerous going forward” Vaudreuil continued about Boca’s second PDL game. Jersey Shore Boca was awarded a PDL franchise from the United Soccer Leagues in November of 2002. Boca will play a provisional 12 game PDL schedule in 2003. Boca is also a three-year member of the United Soccer Leagues elite youth Super Y-League.